Peter Parker is going abroad this summer in Marvel Studios' "Spider-Man: Far From Home"! It seems that no matter how far he strays from Queens, Peter cannot escape his greatest responsibilities. To prepare fans for the film's release on July 5, creative trio Will Corona Pilgrim, Peter David, and Luca Maresca are presenting a wall-crawling two-part prelude series. 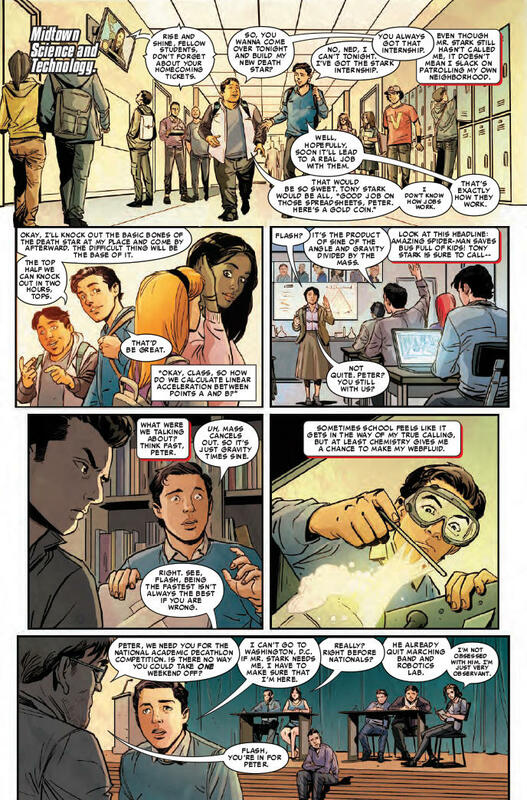 And since SPIDER-MAN: FAR FROM HOME PRELUDE #1 is on sale at your local comic shop today, we're looking at the action inside the issue. So, years ago, following the Avengers’ battle against the Chitauri in Manhattan, Adrian Toomes and his junk removal crew were busy cleaning up the city. All of a sudden, however, he and his men were removed from the project by the government’s partnership with Stark Industries that established Damage Control. Now without jobs and a steady income, Toomes and his employees turned to the black market salvaging and selling of alien technology left behind by Loki’s Chitauri army. In fact, Toomes used some of it to create a flight suit, which turned him into the villain known as Vulture. Over in Queens, Peter Parker, fresh off his trip to help Iron Man in his battle against Captain America in Germany, is palling it up with Tony Stark and Tony’s personal point man, Happy Hogan. Peter is keen to go on another mission with the Avengers, but Tony doesn’t really share the sentiment. 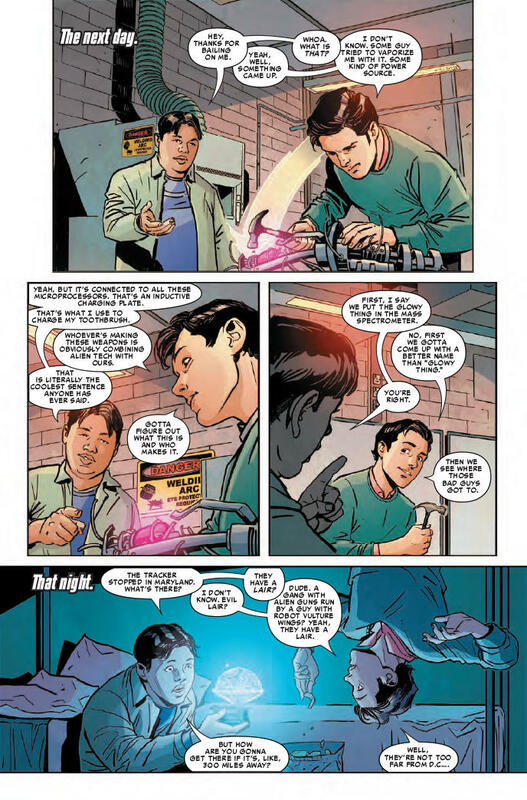 Using an “internship” at Stark Industries as a cover, Peter shirks his friends, like Ned Leeds, in order to patrol the neighborhood as Spider-Man. Even school seems less important now that he's a Super Hero, and he declines an offer to attend an academic decathlon in Washington, D.C. Donning the high-tech Spidey suit given to him by Stark, Peter patrols the area, stopping petty thieves. Finally, he gets some real action: a bank robbery, but what he isn’t prepared for is that the thieves have alien tech given to them by Toomes’ black market operation. Peter tries to tell this to Happy who doesn’t really have time for it, simply telling Parker to stay out of any dangerous situations. Soon after, Peter returns home as Spider-Man, completely blowing his secret identity to Ned. During dinner that night, Aunt May also tells Peter to avoid dangerous situations, although she’s completely unaware that he’s Spider-Man. At school at the next day, Ned pesters Peter with a ton of questions about what it’s like to be Spider-Man. Very excited, Ned offers to be Parker’s “guy with a headset telling the other guy where to go," but Pete gives him a quick no thanks. Peter and Ned are invited to a party that night (the plan being that Peter will show up as Spider-Man to boost his and Ned’s coolness at school). Just as he’s about to go in, Peter spots an explosion and goes to investigate, stumbling upon an alien arms deal. A battle ensues with the thugs, ending in an eventual appearance from Vulture who snatches up Peter and drops him in a lake. Luckily, one of Stark’s Iron Man drones rescues him from the depths. Stark, though, is not pleased, urging Peter to stay away from Vulture, stick to small-time crimes and call in Happy if the arms dealers show up again. His first encounter with the bad guys nets Peter a Chitauri power core. Having shot a tracking device onto one of Toomes’ men, Peter is led to Maryland, using the decathlon as an excuse to go to the D.C. areas and investigate. To keep Happy and Tony off his back, Peter removes the tracking device and “Training Wheels Protocol” from his Spidey suit and heads out into the night and refusing to go for a dip with his high school crush, Liz. With some help from his suit’s new operating system, “Karen”, Spider-Man finds the Vulture attempting a heist of alien tech parts headed for a government warehouse. He thwarts the robbery, but ends up trapped in the place. He eventually escapes, although not in time to make the decathlon. 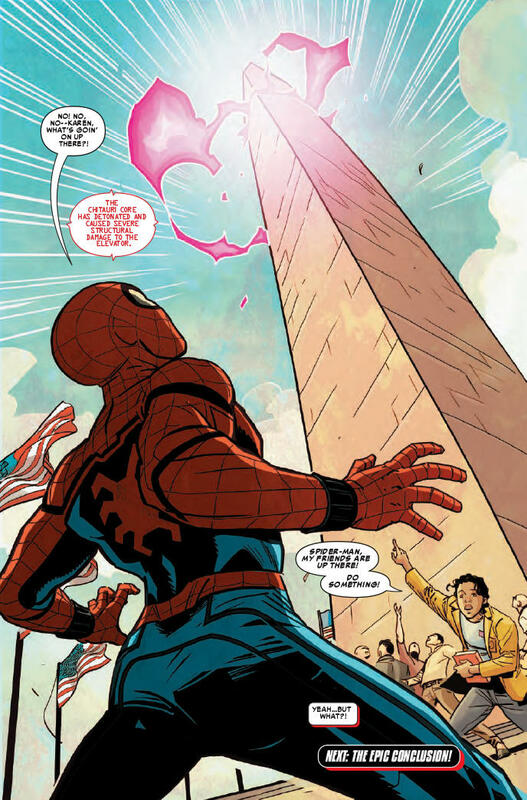 As Ned and Peter’s fellow students head for the Washington Monument, Peter is now aware that a dose of radiation could turn the Chitauri core thing into a massive bomb. And that’s where PRELUDE #1 ends! 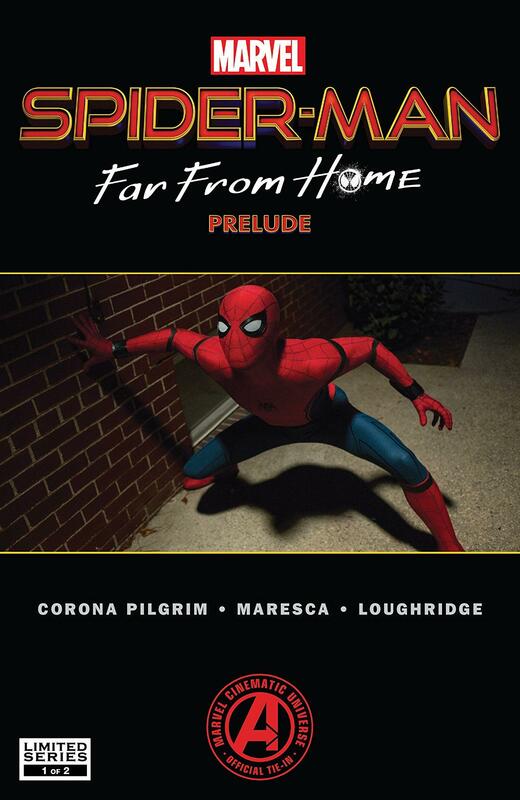 Read SPIDER-MAN: FAR FROM HOME PRELUDE #1 at your local comic shop now! Then see where Spider-Man is heading next in "Spider-Man: Far From Home" in theaters on July 5.